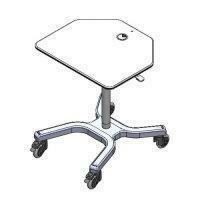 #60251 X-shaped base computer mobile cart(model #60251X series) - Sallas Industrial Co., Ltd.
Sallas X-shaped base pneumatic lift computer mobile cart is designed to be high quality appearance and competitively priced. It provides maximum cart versatility and steady. Pneumatic lift platform with easy one handed operation. Infinite adjustments between low and high heights, platform height adjustment from 710mm to 1070mm. 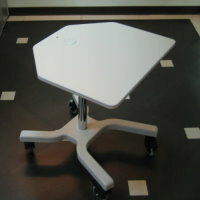 Table top size L676 x W575 with durable plastic edge to protect the platform for durability. Steady X-shaped L542 x W475 (mm) base with durable high-impact plastic base cover and 4 x 4" heavy duty wheels(2 lockable). Optional LCD mounts, CPU mounts and cable management accessories.